Last week I played my first game of L’Art De La Guerre (ADLG) which I enjoyed enormously. I would like to thank John McIntosh for hosting the game and helping me get used to the ways of ADLG. As others have said there’s a degree of familiarity about ADLG such that, if you’ve played FOG or any DBx game before, you should immediately recognise many of the concepts used. Needless to say I began to feel comfortable very quickly. I found the 200 point game absorbing with a surprising amount going on very quickly. The first thing I’d missed with my initial reading is that the shooting is worked out twice if the target shoots back. This means that you can end up doing the above twice: once as a shooter and once as a target. Trying to work out all the modifiers before rolling the dice, as I would with FOG, which wasn’t sensible. I kept forgetting to use different modifiers when my target was shooting back. Expecting too much from the quality modification for my elite horse archers. In ADLG better quality modification prevents bad scores it does not improve good ones. I’ve written before about using flowcharts, and the logic they impose, to uncover the hidden complexities and inconsistencies in wargames rules. 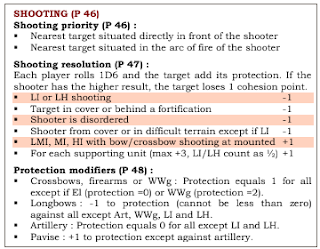 So I decided to “deconstruct” the shooting process to see what lay beneath and to help me learn this part of the rules. Stop reading now if flowcharts make you squeamish. In the game this is easy to apply as it’s just a set of cumulative wargames modifiers. Although I’d say the last two in the chain are a little “layered” but not unusually so for wargames rules. Firstly, the list is doing two quite different things. In some cases (with exceptions) it changes the base protection level completely from those on page 20 and the main table in the QRS. In others it applies standard modifiers (with exceptions, of course). 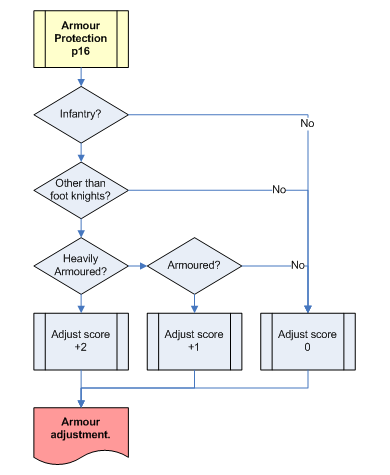 Secondly, one must remember to add the armour factor for all infantry other than foot knights (see below) when facing certain weapons. Worryingly, this isn’t mentioned on p 48 with the other protection modifiers but is on p 16 instead. As the modifiers are doing two different things the process has many possible outcomes rather than just one: from no change, through a range of adjusted and changed & adjusted protection scores to two completely changed protection values. This means that the protection process is deceptively simple and certainly far more complex than you’d expect on first reading the rules or looking at the QRS. I suppose one could shift the armour test to the beginning but as crossbows, firearms and artillery are unaffected by armour I felt it “cleaner” to put it after these weapon tests. One point worth repeating is that the armour protection modifier only applies to infantry but not to foot knights. They, and all mounted, have the effects of armour built into their base protection factor (p 20). A little convoluted. I think I can see why they did it but to me it means the armour & troop definitions aren’t internally consistent: some definitions include armour and some don’t. No wonder I found shooting hard to pick up quickly. Now that I’ve played a game and gone through the rules to write this piece I feel confident relying on just the QRS but I will try to do things in the right (logical?) order. Roll the dice first & apply the quality modifiers first. Elite modifiers only apply to low dice scores. Shooting modifiers are standard modifiers (with exceptions). 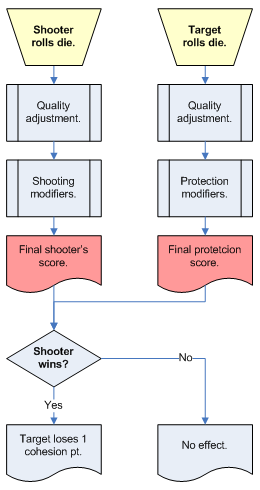 Protection modifiers are more complex. Some protection modifiers change the base protection value. Other protection modifiers are standard modifiers (with exceptions). Remember to add armour protection if the target is infantry. In some situations a changed protection value will be further modified. If the target shoots back remember you will roll twice & switch modifiers. correct. The relevant image has been corrected and the post edited to explain why. I knew this part of the process was convoluted!